Jobs in Silicone Allee can be a little precarious. There’s the glut of part-time, low wage work that is a pain for most start up employees (unless you had the foresight to study programming, of course, in which case, gratuliern). Before you battle your way to an (inevitably fixed-term) full-time contract, there’s the tough job of surviving on the pitifully low intern salaries. Even with Berlin’s famously low rents, living on 400€ or less is not for the faint hearted. We assume that you’ve figured out your living situation, but there are some expenses you just can’t account for. Lunch is a big one. Loads of offices in Silicone Allee have an eat-out culture, and this can be a proper strain on the wallets of the over-educated and the under-employed interns, minijobbers and hard-done by. So if you find yourself in one of those offices where everyone eats out, and socialising is how you land that full-time gig (trust us, that’s nearly every office in Silicone Allee) we’ve knocked together a list of five places you can eat lunch out and still get change for a fiver. Be brave and keep job hunting, but in the meantime here’s our pick of the best places to get cheap lunch to see you through the week. 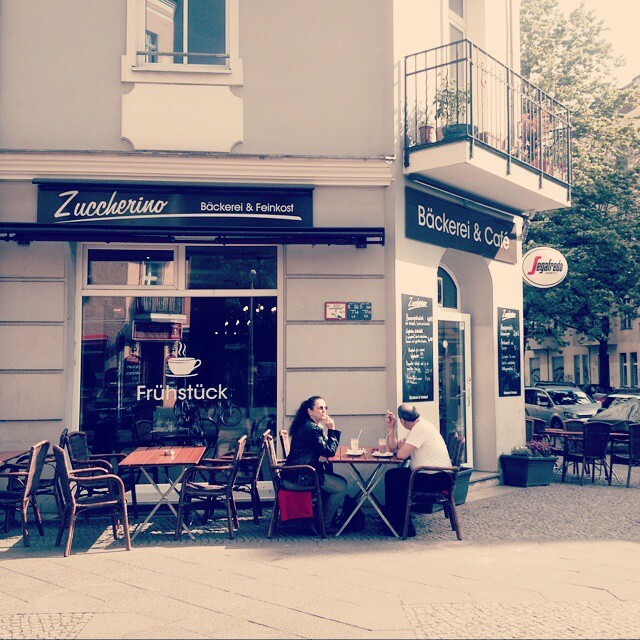 This is my absolute favourite place to get lunch in Prenzlauerberg. This place is ostensibly a bakery, and there are of course plenty of yummy German baked goods on offer, but the real good stuff is the salads and soups. For the princely sum of 2.20€ you can be the proud owner of a lentil salad (looks little but don’t be fooled, this will definitely fill you). There’s also chickpea and couscous salads that come in for under 3€ too. If you need something warming, there are chilli con carne and lentil soups which come in under budget as well. The tuna salad is delicious but is pushing it at precisely 5€, so maybe save that for when they start paying you properly. OK, so there’s zero atmospheres, but there are places to eat outside, and it is right by Mauerpark if you order to take away. 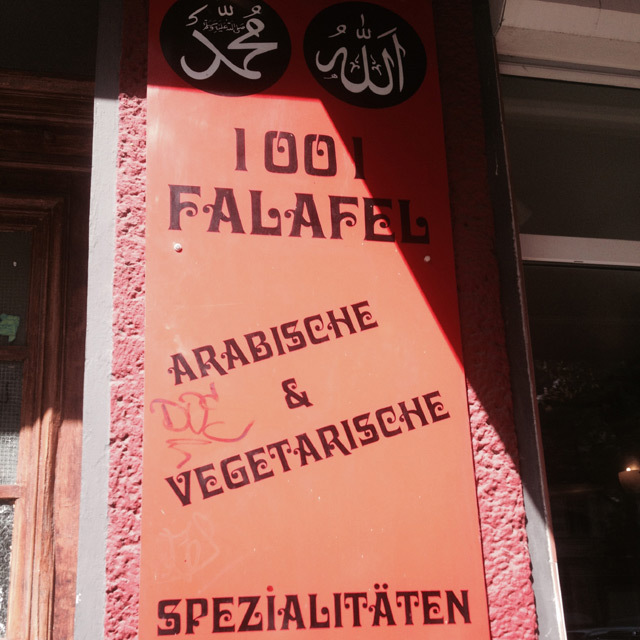 Easily the cheapest place for a healthy-ish lunch in Silicone Allee. This place almost needs no introduction. Typically featured in the ‘when you visit Berlin’ lists of classic imbisses, Konnopke’s is one of the city’s granddaddies of takeaway. But, underpaid Silicone Allee sufferer, there is a dine-in option (the only attempt in warm weather) for when the 28-year-old CEO wants to go for lunch with you, and obviously isn’t going to pay. Your options here are fairly limited. There a five or six kinds of Wurst that will set you back about 2€ each, and chips will put another 1,50€ on the bill. Alternatively, you can opt for potato or pasta salad and come out at around 4€ all in. Not exactly the healthiest choice, but you can feasibly defend your lunch choices as a tribute to the history of the city. Not sure that this will help you land a job though. Good grief this place is cheap. There’s a tonne of places to get falafel in Berlin, obviously, but there are few meals as disappointing as floury, undercooked falafel in dry bread. As such, a place that knows what it’s doing for less than a fiver ought to be celebrated. At 1001 Falafel, wraps all come in at under 4€, and for 5€ you can sneak a proper Lebanese-style mezze mixed plate. Space inside is pretty limited, but in summer they have tables out onto the street. Service is speedy and friendly and the food is reliably excellent. Be warned however, these are properly filling wraps and your productivity may actually hit zero once you’re back in the office, so sometimes it’s better to have half each with a pal and grab something sweet on the way back in. 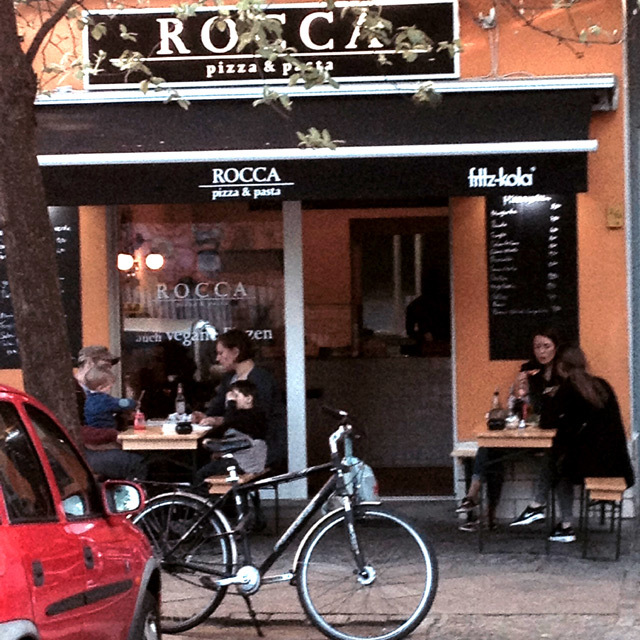 Rocca serves proper, Italian-style, by the slice pizza. This is manna from heaven, thin-crusted, stone baked pizza, yours for just 2,50€. This tops our chart for treat-yourself-food, cheesy and indulgent, this is enough to make your colleagues that spent 8€ on sushi turn green with envy. Once the slice is plenty, although if you’re with a pal, get three between you and share. Rocca takes pizza seriously, so there are even chili and garlic oils to slaver all over your goodies, not great for your colleagues, but marvelous for you. There’s not much by way of places to sit inside, although there are tables outside. It’s on the shady side of the street so our recommendation would be to get it boxed up and walk the 200m into Mauerpark and soak up the sun there. Sushi and Vietnamese food are everywhere in Prenzlauerberg, but most places start at around 6.50€ and go up from there. Not at Ha-an Sushi though. Here is an example of a properly democratically priced menu, so it’s great for team meetings where there’s no one paying for you. You can get basic maki rolls for between 1-3€ and the fancier plates start at 4€. Of course, if the CFO is coming, there are unagi and sea urchin rolls for a bit more dosh, but most orders come in under a fiver. If there’s more than one of you suffering on 600€/monthly, there are 2-4-1 dishes that’ll go down a treat, and keep things affordable. There are all the traditional sushi accompaniments, although this is a no-frills kind of place, so there’s little by the way of care in the presentation. Don’t let this deter you; this is great sushi at affordable prices. You can find her at www.bulletproofed.org where she hides her academic proofreading business.